Ideal for city or countryside riding, Tenby comes in matt black with design-led copper accents so you can commute in style. 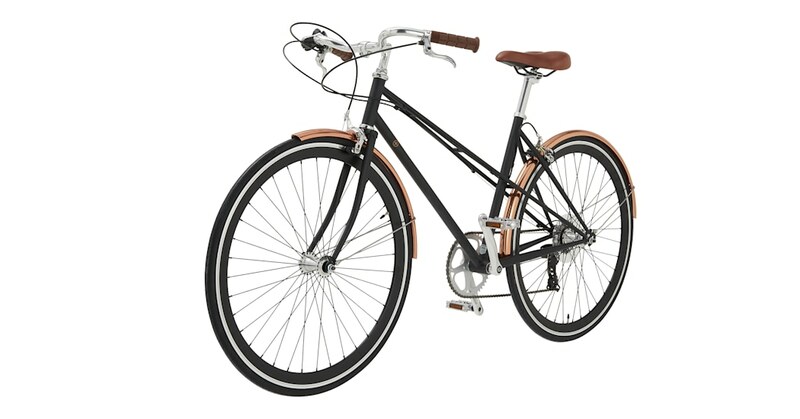 Plus, this sophisticated bike is easily fitted with baskets, bells and accessories. Check out our range of helmets in coordinating finishes of matt black, copper and brass to keep you safe en route. Tenby is ideal whether you’re in the city or tackling country terrain. A 7-speed bike with gears by industry leaders, Shimano Gears, Tenby is fitted with a lightweight, high-grade steel frame for a smoother ride. Our bikes are all unisex, and arrive 80% assembled. Just add the front wheel, pedals, seatpost and handlebar, then pump up the tyres. Full instructions for home assembly are included, but we'd recommend letting a professional bike store do the initial set up. It may not be free – but peace of mind is priceless. Clean your bicycle every month and remove any loose dirt with ordinary soapy water or bike solution.